As the controversy surrounding the Environmental Protection Agency and water contamination heats up in Washington, D.C., Purdue University researchers have developed a technology to remove pharmaceuticals, including antibiotics and controlled substances, and chemical contaminants from public water systems. The concern about water contaminants has been making headlines in the past couple of months as the EPA held a national summit on the issue. According to Reynaldo Barreto, an associate professor in the Department of Chemistry and Physics at Purdue University Northwest, organic compounds and pharmaceuticals are commonly being found in public water supplies. "The effect of these trace contaminants in the water supply is unknown," said Barreto, who led a team of undergraduate students to develop the new technology. "Although little is known about the many organic and pharmaceutical compounds, their presence in the water supply, even in trace amounts, poses a real threat to public health." Barreto and his students developed a series of continuous-flow photoreactors to effectively remove chemical products and compounds, commonly used as solvents and gasoline additives, from water supplies. 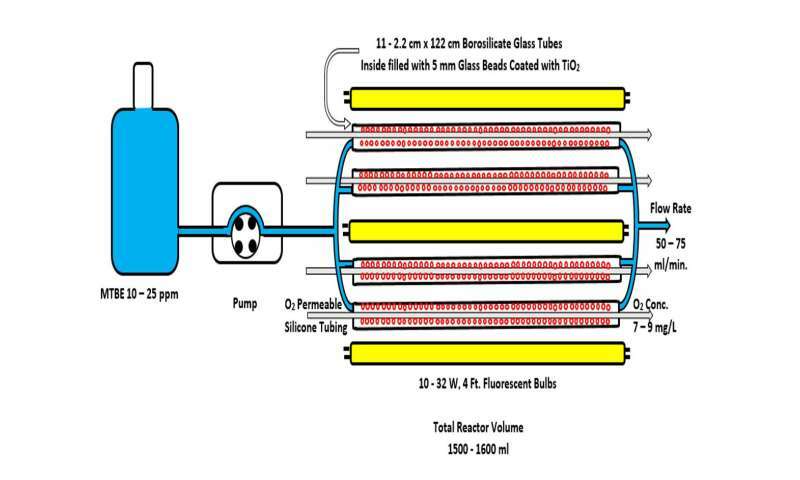 The photoreactors are made of glass tubes, with silicone tubing inside for oxygenation, packed with glass beads and lined with the same fluorescent light tubes found in most homes. The tubing is pressurized and then water flows through and the combination of the light, silicone and glass removes the trace contaminants. "This is arguably the most advanced continuous-flow photoreactor design of its kind in the world and is scalable for municipal system demands," Barreto said. "Our type of reactor system can simply be added to the end of current treatment processes without affecting the existing systems." Current techniques used to try to remove the contaminants can be costly and time-consuming. The chemical inertness of many of these compounds makes remediation of these chemicals both expensive and difficult to apply to large systems. "There is currently no effective way to remove these trace compounds from treated water," Barreto said. "This would be the first process that could address these contaminants efficiently and economically."